Burning Man is now a massive spectacle, but it had humble origins on San Francisco's Baker Beach. What meek little event will grow up to be the next big thing? Here's one dark horse racing out of Europe's most underappreciated capital city. Do you know another burgeoning event that captures the Burning Man spirit? Tell me about it in the comments. "You!" I heard. I looked up to see a man in a top hat and vest approaching with his left hand up. His eyes glimmered and a small smile cracked inside a dark beard. "Come get some," the guy said as we locked gazes. I arrived at Lightning in a Bottle a bit frazzled. The decision to go was made a week prior, my friend dropped out a few days before, and I scrambled to find a photographer until the final minute. Arriving in the wee hours of the first night, I pitched my tent on a bare hillside. The person I'd come to film, Hannah Fraser, was on the other end of the grounds and we failed to connect. My photographer wasn't coming until the next night. I was alone as I set out to walk around. Have you ever entered a raucous bar at 1am stone sober? Have you slipped into a solemn church feeling rambunctious? In both cases the disparity of the energy inside and outside of you is striking. This was me walking around LIB. The crowd was full of people who were amped. They'd spent weeks or months in anticipation. They knew the lineups and artists. They had been jamming it out in a caravan full of buddies the whole drive over. And there was lonely Jonathan ambling around like he was on a filming delay, very conscious of being friendless and on the older spectrum of the age scale. Maybe I'd just get the shots the next day and retreat to familiar ground. 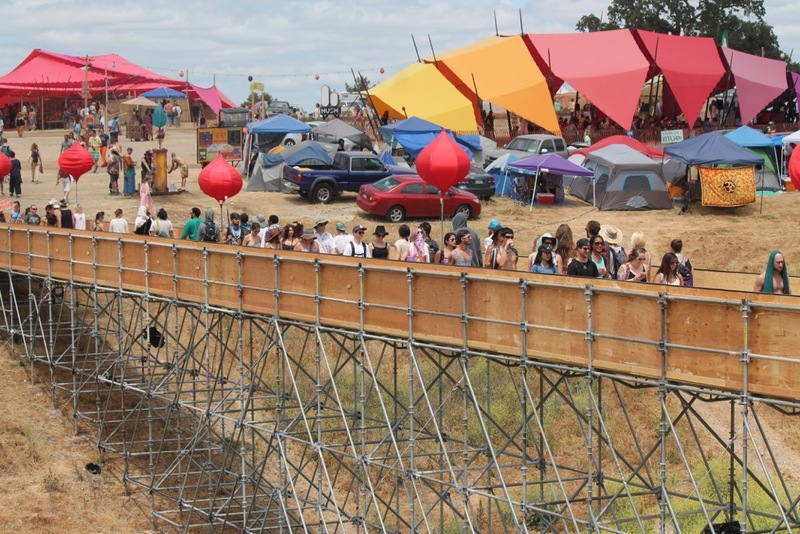 Lightning in a Bottle is held in the sun scorched San Antonio Recreation Area of central California. Outdoor enthusiasts once came here for it's 16 mile lake which has since completely evaporated due to the drought. To get from one end of the festival to the other one must cross several footbridges which span dusty ravine beds that once fed the lake. It was on these junctions that I found my redemption. There is an LIB tradition of high-fiving people who are walking the opposite way on a bridge. At least 50% of attendees are in on this game, and a good 10% are adamant about it. As I crossed my first bridge one of the true believers saw Mr. Humdrum coming and he singled me out. "You!" said top hat, grabbing my attention. I pulled my hand out of my pocket and lifted it up. It was like a joust of good will, two men in motion narrowly crossing, one guy with his lance up, the other raising his just in time as the distance closed. "Smack!" we made contact. And then "Smack, smack, smack!" The three folks behind him immediately responded to my upraised hand and emerging grin. I was suddenly on high-five automatic. There is something quite miraculous that happens when you receive a high-five. It's almost impossible to not smile. A surge of energy streams through you. It's as if the giver is passing you a portion of their positivity or a jolt of their current. In fact, scientific studies have shown that this kind of touch reduces feelings of threat and promotes trust and cooperation. It releases the feel-good brain juice oxytocin and reduces the stress chemical cortisol. I immediately committed to being one of the 10% high-five enthusiasts. On every bridge at every occasion I had my hand raised. Take it or leave it, it was staying up. I could now spot people stuck in the rut of my old low-energy position, walking with their gaze averted, hands in pockets, shoulders slumped. I empathized with their state. To them I sent a warm welcome: "Come get some." Let me encourage you to look for ways to acknowledge people today. If you see a lonely kid bust a trick on his skateboard, if you hear a person speaking of good news, or if you see someone go out of their way to act compassionately then tell them you see them. Maybe with a smile and a nod. Perhaps with a shout of "nice one." Or, if the moment feels right, raise that hand in the air and give some. I promise you'll get some back.